Preheat oven to 200°C, gas mark 6. 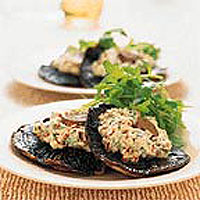 Drizzle the mushrooms with the oil and season with a little freshly ground black pepper. Place on a baking tray, stalk side up, and cook for 10 minutes, until the mushrooms are just tender. Meanwhile, place the Boursin in a bowl and mix in the sundried tomatoes and basil. Divide the Boursin mixture between the mushrooms, leaving the stalk exposed. Return to the oven for 2-3 minutes to heat the filling. Toss the rocket in a little dressing. Remove the mushrooms from the oven once the filling has heated through, and garnish with basil. Serve immediately with the dressed rocket and slices of petit pain roll. to serve this at breakfast, replace the sundried tomatoes and basil with 3 rashers of crispy, cooked bacon, chopped.